A party in one of the largest bbq grill chain in the metro. A party in one of the funnest bar where they conduct weekly quiz nights over booze. A party in one of the most sophisticated club in The Fort. A party in two of the TOP Clubs in Resorts World. It is going to happen this Saturday, June 29th. Sweet right? What's sweeter is everything you pay for will help someone's dream to be a reality. Recently, there has been an increase in the number of water related accidents in the lovely island of Boracay. But there is also a shortage of trained lifeguards. 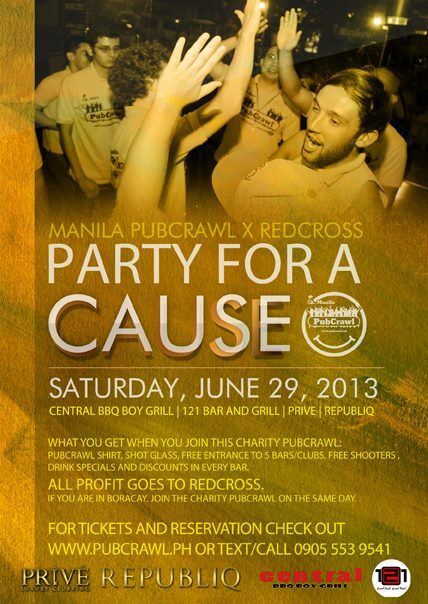 Together with Red Cross Malay Chapter, PubCrawl Philippines will conduct simultaneous Charity PubCrawl in Boracay and Manila! All net proceeds will go to the lifeguard training of young locals in Boracay, giving them free education and livelihood. Hey, more good news. Neneng Bakit will also party with us.